AKA: Lazy Girl's No-peel Over-ripe Peach Jam! First: Obtain a large quantity of peaches, then suddenly get insanely busy for about 4 days. Then, finally have time to can your peaches, and realize that they are just a *titch* overripe. But oh so fragrant! Next: Begin the peach- peeling process. Simmer water, have a bowl of ice water at the ready, and 2 other empty bowls left to hold the peaches, and the pits/peels. Blanch peaches in simmering water, place in ice water, and then peel the skin off. On regular, perfectly ripe peaches, this is easy. With overripe peaches, this is not easy. Swear alot, then go to plan B. Plan B involves thinking about how people eat peach peels when they eat fresh peaches so how could they be THAT bad in jam, and then dumping the bowls of hot and ice water and simply washing, stoning and quartering the lovely soft peaches and putting them in a big heavy pot. 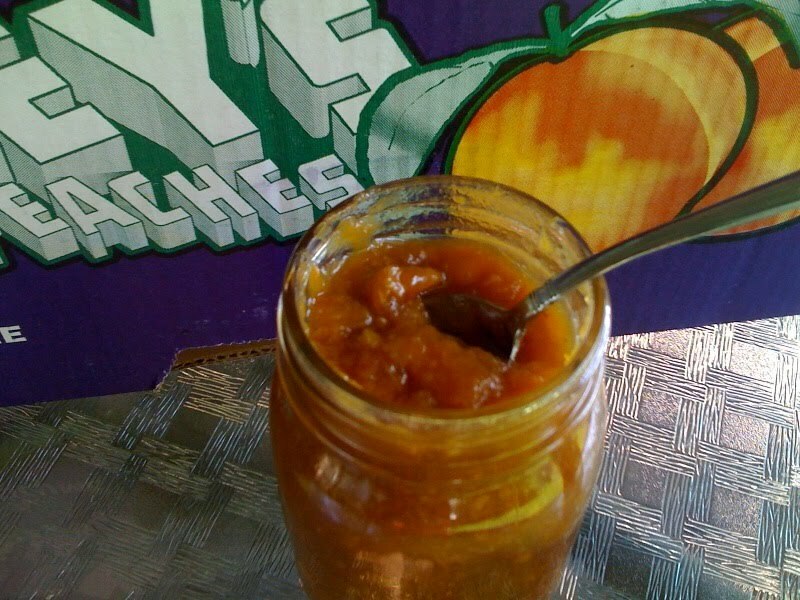 The Inspiration Recipe, in this instance, is this Butterscotch Peach Jam recipe, which is YUM! I know, because I tasted Abby's (thanks Abby!). So I followed this recipe, more or less. I smooshed my peaches (with my hands, because I don't have a potato masher), then added brown sugar to taste. I think "to taste" is very important in this recipe, because it will depend on how ripe/sweet your peaches are, how sweet you like your jam, and, how salty you like it. Because yes...next I deviated from this recipe. After adding my brown sugar and about a half cup of lemon juice, I let it simmer at very low heat for a bit over an hour, while the peaches cooked, and the whole mixture got dark, rich and fragrant...mmmm. Butterscotch-ey. Then, THEN. Then, you bust out the GOOD SALT. I used some delicious, moist Celtic Sea Salt....and added about a tablespoon. Stir, taste, and see what you think. I ended up adding about 1 1/2 tbsp., because to me, that was the lovely blend of sweet/salty/peachy/butterscotch that I was looking for. YMMV, so, taste as you add. Pour into your hot jars and process as for peach butter (consult the Ball Blue Book for times in your area), and then...devour! I am thinking this is way more versatile than just Jam. YES, I plan to enjoy it on some good whole wheat toast bread with a bit of butter. But I also plan to warm it, and spoon it over fresh shortbread with whipped cream on top. And I think it would be divine over fresh homemade gingerbread. Or on ice cream. Awesome! I love that recipe-so easy. I hate having to peel fruit. Hate, hate, hate. I think that is part of why that one appealed. I am so salting mine next time. I love to eat a tablespoon on top of cottage cheese. One of my favorite snacks! Definitely an ice cream or gelato topper, as well. No peeling? I'm definitely in! I can't wait to try this..I love salty/sweet mixes. Guess who just got some peaches yesterday? Mmmm.. My daughter and I just made peach Jam last weekend. She aptly named it July Gelatinous Yum. My mouth is watering. I Love, Love, Love Sweet/Salty taste. Can't wait to try. Thanks for the link to WellPreserved - big fan of preserving the peach as I think it holds it`s flavours the absolute best of most other fruits. Sounds awesome! I even froze some peaches whole because they were too ripe & I was busy. Maybe I'll try this! In our family I think this would make a great topping for a pork chop! Mmmmmm, now I'm drooling!